An Explore subscription will provide you with a total of four issues of our daily Bible reading notes and each copy will be posted to you quarterly. 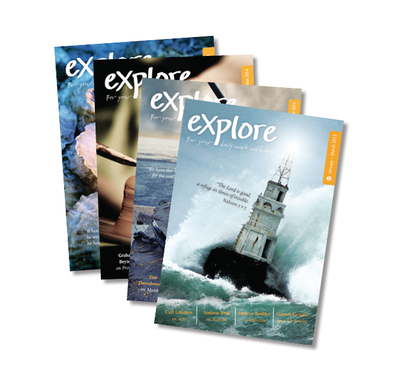 Sign up to an annual Explore subscription (which covers 4 issues) and every quarter we will deliver a copy direct to your door. Each issue contains three months of daily readings with ideas for prayer and application, to help you understand clearly the message & challenge of God's word. The best way to find the answer is to adopt a pattern of daily Bible study and prayer. Not only does this give the reader more knowledge of the Bible but, more importantly, it offers a chance to listen and hear God speaking personally to them through his strongest medium - The Word. • Time Out, linking to a different part of the Bible, or raising an interesting thought to reflect on. Subscribe now and you will be offered the Explore Prayer Diary at the special price of £2.99 at the checkout. • Incisive; not a 'thought for the day' approach, but clear and careful teaching within the context of the whole of the Bible's revelation. An inter-denominational team of contributors includes Tim Chester, Marcus Nodder, Tim Keller, Ray Ortlund Jr and Tim Thornborough. I have been using these guides for years and wouldn't start my day without them. The topics are always relevant, the teaching is sound and you get to read the whole Bible eventually, a day at a time. I have searched for years to find a consistent, systematic Bible study that really helps you to look deeper into God's word as well as offering practical applications - I am so glad I came across this! It is WELL worth the £16.99 yearly subscription - I highly recommend it. For me, this starts the day well and encourages me to read the whole of the Bible bit by bit and to feed my soul. I like to have a good variety of writers to give me differing angles of commentary on God's wonderful truth. Explore has become my ‘daily bread’, first thing every morning. Each bite-sized lesson is wonderfully cross referenced between testaments and prophecies demonstrating the power and fulfilment of Our Lord God’s Word and enabling me to truly know Him and grow as a Christian. I have been using Explore for some years now. Sometimes I have got tired of a scheme and wanted to break out and do my own thing for a bit, but this has not happened with Explore. There is a variety of writers and they are all good at keeping the amounts to take in manageable and profitable, with sound applications. I have a number of friends who also use Explore and we are often able to apply what we have read in the morning to situations around us. I have also found the studies useful for sharing with my church's ladies' group. In our meetings we want to spend time catching up with each other and having some time to pray, but, many, especially young mums, like to include some Bible study, too, and these studies give manageable amounts for that situation. Often group Bible study notes assume an uninterrupted hour or so, and that we do not have! I would recommend Explore to those young or old in the faith.